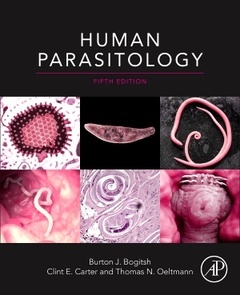 Human Parasitology Bogitsh Burton J., Carter Clint E., Oeltmann Thomas N.
Auteurs : Bogitsh Burton J., Carter Clint E., Oeltmann Thomas N.
Human Parasitology, Fifth Edition, emphasizes a medical perspective while incorporating functional morphology, physiology, biochemistry, and immunology to enhance appreciation of the diverse implications of parasitism. Bridging the gap between classical clinical parasitology texts and traditional encyclopedic treatises, Human Parasitology appeals to students interested in the medical aspects of parasitology and those who require a solid foundation in the biology of parasites. This fifth edition has been fully revised to integrate the most recent molecular discoveries about mosquitoes, ticks and other arthropods as vectors, as well as the most effective therapeutic regimens. Premedical, medical technology, and undergraduate microbiology and parasitology students as well as researchers and professionals in related disciplines.